I am excited to be participating in a new summer series this year. 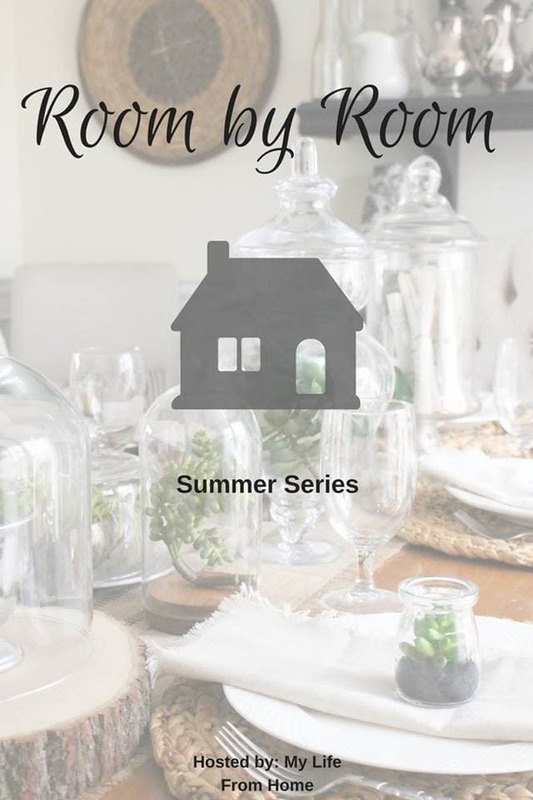 Amy from My Life from Home is hosting a Room by Room Summer series. A group of bloggers will be sharing their summer home, one room at a time. The best thing about this new series, we are sharing our rooms as they are this summer. Not just finished perfect rooms, but each room as they are now. I am excited to share our home and the upcoming projects we have for them. 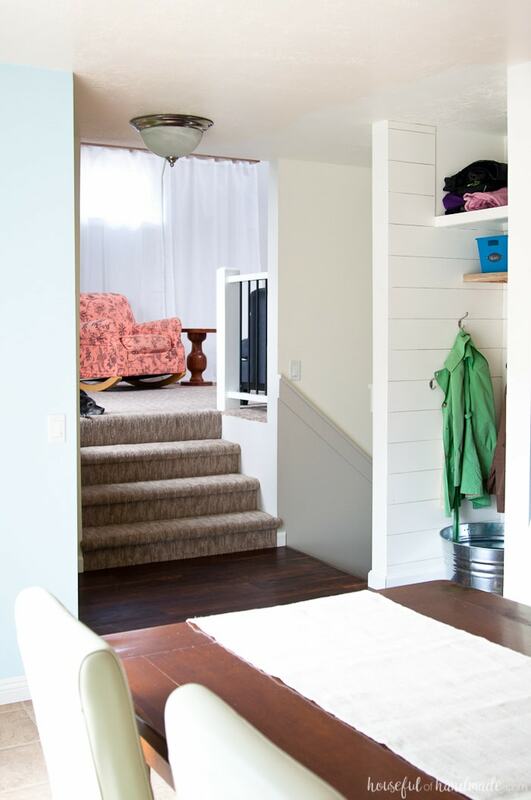 The first room in the series is our farmhouse entryway mudroom. Our entryway is also our mudroom. We are not lucky enough to have a mudroom off our garage (and we don’t actually park in the garage since I took it over as the wood shop). Our entry landing used to have a small coat closet, which did not work for the space. So last summer I started redoing it on a whim. You know, one of those days you just need to rip out a wall, so you do! And we turned that small, useless closet into the perfect farmhouse entryway mudroom. 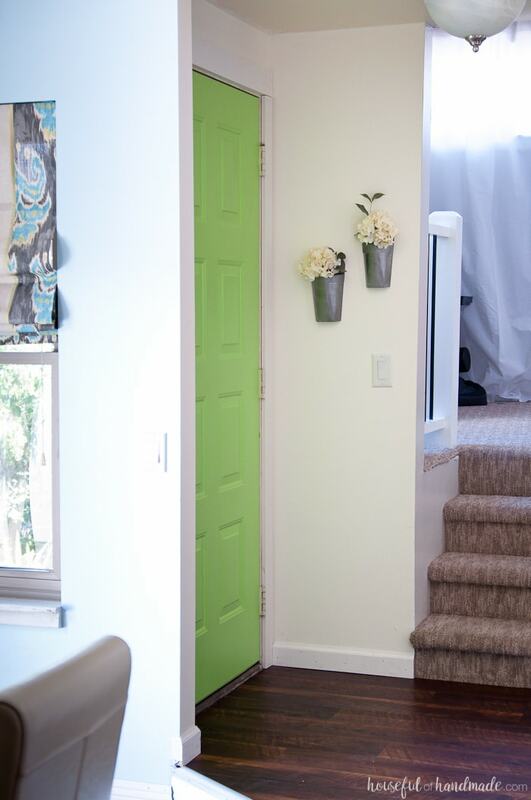 I am super excited to share our summer entryway because even though I started updating the entry last fall (but haven’t quite finished it), this is the first time sharing the remodel with you. And when I finally finish it off (probably this fall), I will share the big reveal with tutorials for each project. After ripping out the useless closet, we covered the inside of our entry closet with faux shiplap. It was used to add style to the small space as well as to cover up the less than even drywall left over from ripping out the closet. Then I painted the entire space with Pot of Cream by Behr. This is the paint I use on all my ceilings. I also used it as the top half of the stairway that is right next to our entryway mudroom. 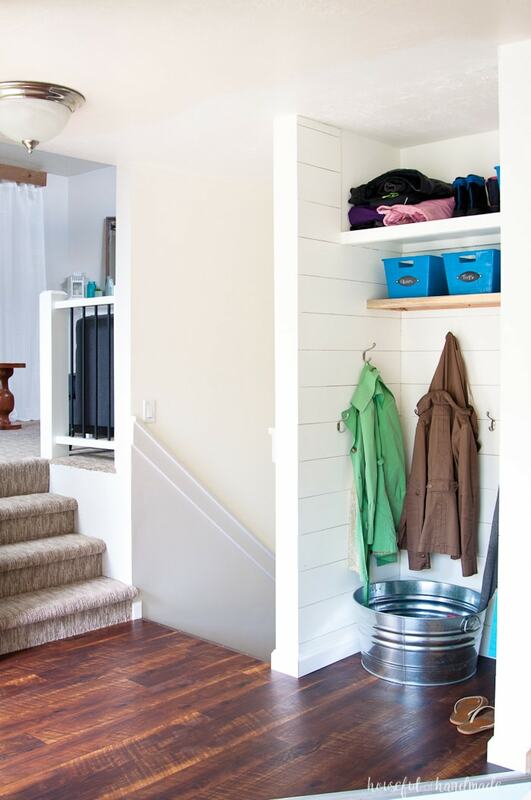 Our entryway mudroom must accommodate all the seasons here in Utah. We have the best of spring, fall, winter and summer. And each season we need to adjust what we have in the entryway so that it works for our family. So when redesigning our small space to work for a family of 4, storage was super important. I started by adding a shelf at the top to store out-of-season gear. In the summer, it is loaded with our snow pants, boots, gloves, and winter coats. I say the remodel is not finished, because I do plan on adding doors to this shelf. It will look like a kitchen cabinet above the rest of the mudroom. The perfect way to store away the seasonal gear, but keep it handy in case of another crazy May snow storm. Then below the storage shelf, is an open shelf for the things we use during that season. I bought these 3 bins from the dollar store. The color works nicely in our space since I use a lot of blue, so the only DIY they needed was labels. I made these easy chalkboard labels so that I can quickly switch them out when I switch out the gear. For summer we use the bins for our gardening and work gloves, outdoor toys (like bubbles and chalk), and swimming goggles. 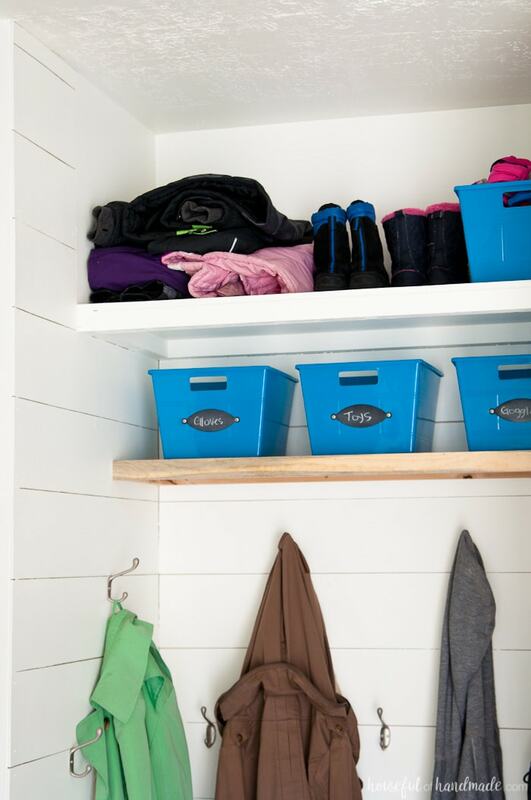 The kids know where to put things back when they are done with them, and it keeps the small farmhouse entryway mudroom clean. Below the shelf I added lots and lots of hooks! Hooks are super important for keeping us organized. They are used to hold coats, backpacks, jackets and umbrellas. Each season we put out the items needed so they are quick to grab before heading out the door, and quick to put away when coming home. And finally, the very bottom of our small mudroom closet we have a large galvanized steel bucket to corral our shoes. The bucket is large enough to hold snow boots in the winter (and catch all the water that comes with them) and still works to hold everyones flip-flops in the summer. 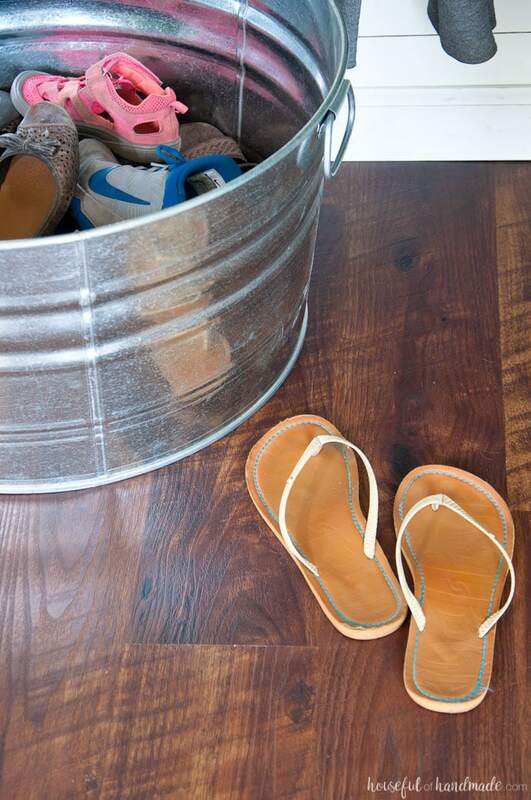 To be honest, I probably have about 4 pair of shoes in the entryway mudroom at any given time, but my husband is usually worse! Luckily the bucket still keeps the space clutter free so it doesn’t drive me crazy. Last fall I did share the new flooring we installed after we ripped out the closet area. I am completely in love with the vinyl plank flooring we installed in the space. It looks like wood, but holds up to the weather and moisture like a vinyl floor. That was super important to keeping our entryway looking beautiful during the snowy winter and wet spring. And bonus, it was so easy for me to install all by myself in one afternoon (granted it is a small space, but that means more cuts were needed). I love the floor so much, I am planning on using a similar product for our upcoming kitchen remodel! One thing I really wish I had room for in our entryway is a table. I love having a place to decorate and a place to toss my keys and purse. 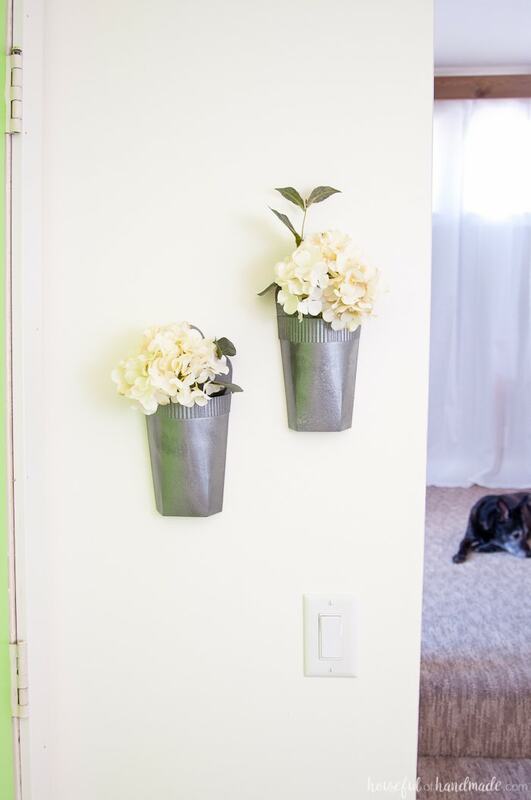 But our landing is barely big enough for the door to swing, so instead I added some decor to the wall with these farmhouse wall vases and silk hydrangea plants (so that I don’t have to worry about killing them). It’s the perfect bit of decor to make the space feel complete and ready for summer. 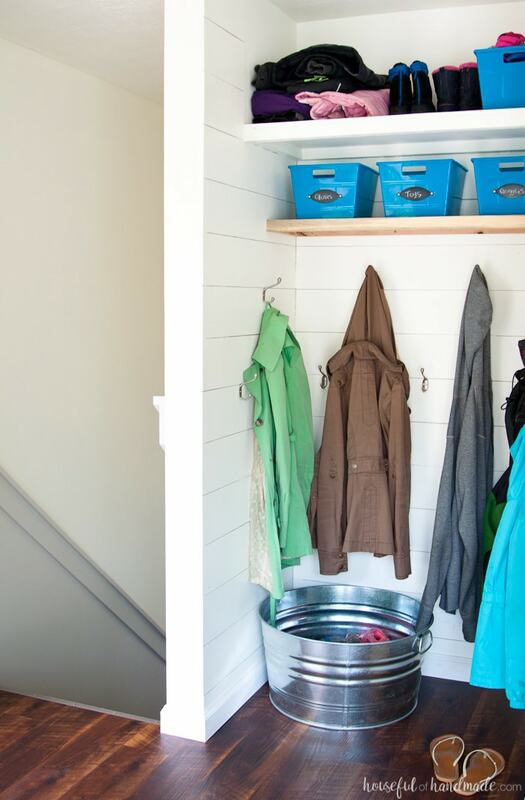 The simple farmhouse entryway mudroom is the perfect place to welcome our guests, store all the stuff our family needs, and keep us organized. And it leads into our living room and dining room so I am much happier now that it is beautiful. I hope you enjoyed the first tour in the Room-by-Room summer series. Next week is all about kitchens. This is the one room of my house that is still as it was when we moved in (minus a new island). I was thinking of skipping the week, but decided I should share it as is so you can see how we have been living for the past 12 years while saving up to have the kitchen of our dreams. Plus I will share our dining room as it is decorated for the summer too! 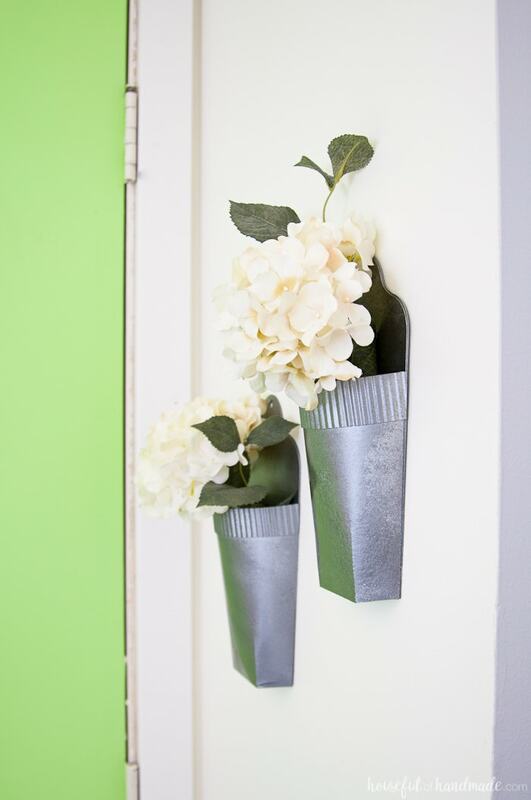 Now grab a cup of iced coffee and enjoy the rest of the summer entryways being shared. Then come back each week as we share a new room. Your entry is awesome! I’m so jealous of your storage in your mudroom area! I am a sucker for storage 😉 Thank you Erin. I think you made a really smart update by ripping out the closet & changing it to a mudroom space! 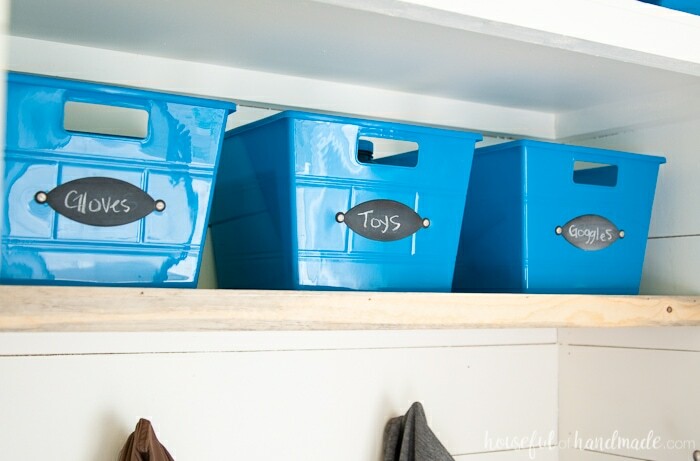 It’s so much more functional this way with the hooks, shelving & spots for bins. Your flooring is gorgeous, too! Wow Kati! 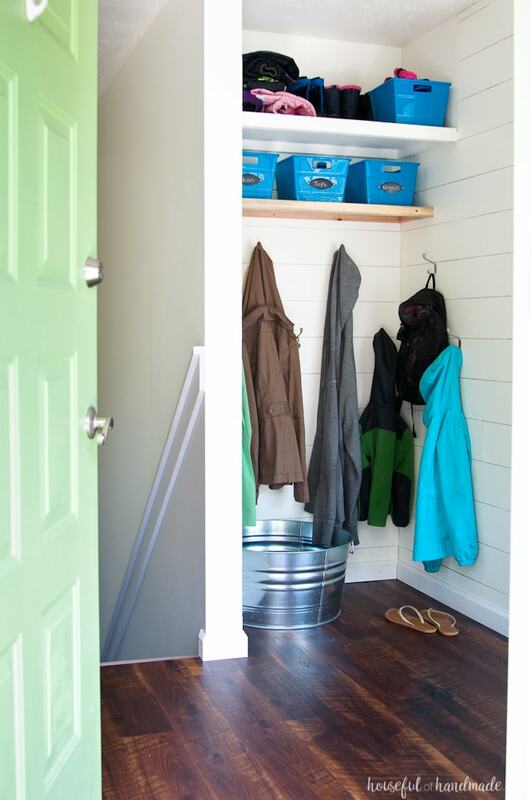 You are super creative to reimagine a closet as a mudroom. Such a great solution for your seasonal gear and it looks great! Thank you. It’s so much better now than the small coat closet. Kati, I love your nook. What a great use of space! The idea for the bucket is genius. I always have a hard time knowing what to do with shoes. Thank you so much for participating in our series! Shoes are a big pain! Must have them but need a place to put them. The bucket is working great so far. This is just a suggestion but how about casters on the bottom of your bucket . Casters could be awesome, but I am sure my kids might turn it into a toy. 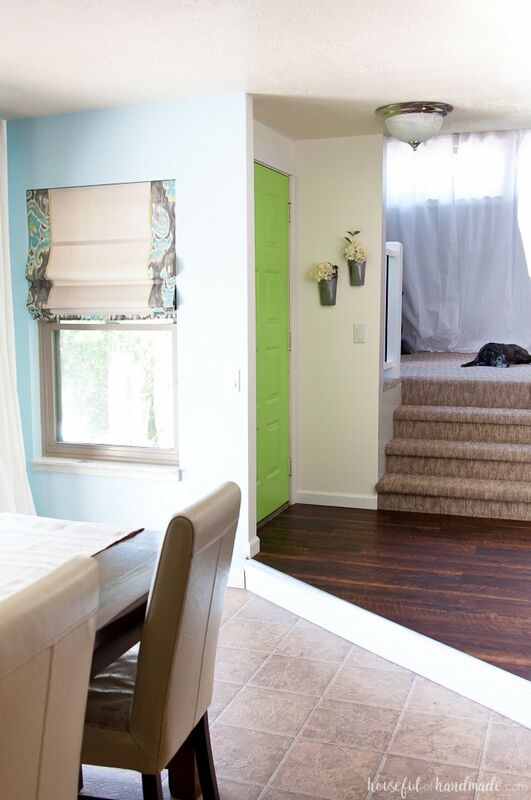 Love the pop of green and the shiplap!